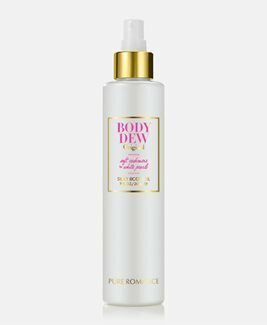 Body Dew keeps even the driest skin happily hydrated and feeling years younger. This gentle moisturizer is infused with beneficial sweet almond oil. A quick spritz after each shower will make your skin feel softer than ever. • 7 fl. oz./210 ml. Glycine Soja (Soybean) Oil, Isopropyl Palmitate, Caprylic/Capric Triglyceride, Carthamus Tinctorius (Safflower) Seed Oil, Fragrance (parfum), Prunus Amygdalus Dulcis (Sweet Almond) Oil, Retinyl Palmitate, Tocopheryl Acetate, BHT, Reconstituted Andronone, Copulandrone, Copuline-alike. Spray on skin after a bath or shower.